On the southern shoreline of the Bahia state, 70 km from Ilheus, lies Itacare. A former fishing village, Itacare was for a long time a hidden pearl on the Atlantic coastline. 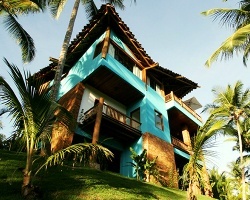 Today, with easy access from the Brazilian highways, Itacare has blossomed into its true vacation destination. With more than 20 wonderful beaches, spectacular waterfalls and an extraordinary reserve of the Atlantic Forest, Itacare is considered by the world's scientific community as one of the most diversified ecosystems on the planet. *Itacare Paradise* is an exclusive eight home complex with access to two of the most exclusive beaches. Itacare Paradise has two types of delightfully furnished bungalows with extraordinary ocean and jungle views and the most exclusive services. 4 weeks per year! Buyer May Receive A Title Fee Credit, Inquire For Details!